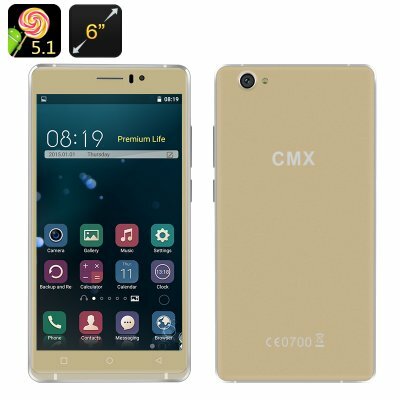 Successfully Added CMX Phablo 6 Inch Smartphone - Android 5.1, Quad Core CPU, Dual SIM, Gesture Control, Smart Wake, Hot Knot (Gold) to your Shopping Cart. Tired of small screen phones that make game playing and movies mundane? It’s time to switch to the CMX Phablo. Available at unbelievable prices and comes in this stylish gold with metallic frame for a luxurious look. Boasting an MTK6580 Quad Core CPU, 1 GB of RAM and the massively popular Mali400 GPU this phone packs plenty of punch. You can really notice the power with a seamless performance when playing games, watching movies or multitasking on the CMX C10 phablet. The expansive 6 inch display if perfect for commuting or long journeys as it makes surfing the web significantly easier. No more struggling to click those tiny links and buttons with this large screen device. The rich colors and high brightness also combine to deliver an Oscar winning performance when playing movies that let you immerse yourself in the action, great for all your viewing pleasure. Kitted out with Android 5.1 and a stylish launcher you can take advantage of all the energy saving and performance enhancing functions in this latest Android OS. Grater customization, heightened user security and energy saving techniques ensures a safe and friendly user environment. The CMX C10 also includes smart wake functions for one touch access to you favorite apps and you can also benefit from the gesture sensing functions that allow touch free navigation through the main menu, photo gallery and music tracks, all controlled by the waver of your hand. A large 2500mAh battery allows for about 4 hours on continuous talk time or as much as four and a half days in standby. You also get hot knot connectivity for quick wireless file transfer and the CMX 10 has front and rear cameras. Great for those selifies or holiday snaps. The CMX C10 Phablet comes with a 12 months warranty. Brought to you by the leader in electronic devices as well as wholesale Android Smartphones..